Dana and I talked about doing something literary for Women’s History Month. We thought that choosing literature as a topic would narrow our focus. As if. I finally decided to share my three favorite heroines, in the order that I met them. 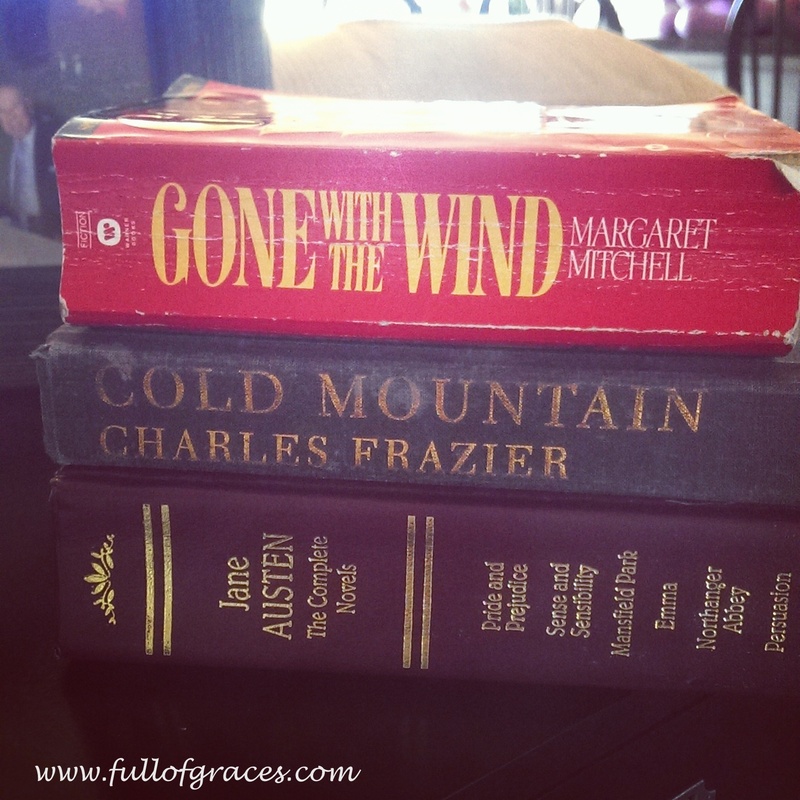 I read Gone with the Wind in 5th grade. I had seen the movie for the first time and asked my mom to read it. She told me that I had to wait a few years. But then my class went on a field trip to the library and I went into the adult section, grabbed the book and palms sweating, checked it out. By now I have read the book at least 15 times. It’s full of thorny cultural problems, such as slavery and the glorification of the early days of the KKK. Some people may argue that you cannot read the book without the context. Fair enough. But then we also have to see Scarlett as more than a Southern belle. All of the female characters in the book are complex, and for most, their movie counterparts are only shadows. It’s really worth the read, all 1500 pages. Scarlett has always fascinated me: a young girl forced to grow up too early and by quickly changing rules in wartime, who then must find a way to stand and lead her people out of trouble. She was the first such female heroine I had ever encountered and I just knew that I would make the same choices in her shoes. I feel her triumph at the picnic at Twelve Oaks, surrounded by admirers. I understand how Ashley’s rejection and Rhett’s mockery drive her to accept Charles’ proposal, because I was young and stupid once. I admire her determination when she stays in Atlanta and delivers Melanie’s baby, then hauls everyone home to Tara–including her own son by Charles–come hell or high water. And when she shakes her fist at the heavens and swears that neither she, nor any of her kin, will ever be hungry again, I believe her. She’s a survivor. I forgive her Frank Kennedy, because selfish Sue Ellen would’ve married him and left Tara to rot. I forgive her post-war greed and Yankee-associating because she was traumatized. The whole Ashley-Rhett-Scarlett triangle is tiring by the end, and Bonnie’s death is a literary cruelty that I will take up with Ms. Mitchell one fine day in the hereafter, but when Rhett walks out on her, I am always outraged. Scarlett is no Steel Magnolia, a passive aggressive mess of manners and emotions. She is simple, what you see is what you get and practical as straight line from here to there. I want to scream “What else does she have to do?!! !” But of course, I know: she has to grow beyond the refugee to the wisdom of mid-life. I love that Mitchell allows us to consider that she may do exactly that. When I first met Ada in the beginning chapters of Cold Mountain, she was not interesting. Fluttery and foolish. I was bored by her inability to adapt. I almost gave up on her when the rooster attacked her in the boxwoods. For the love of goodness. Then came Ruby, one of the greatest supporting characters of all time. I’d not keep a flogging rooster. Ruby’s presence gives us one of the greatest chapter titles in all of literary history: Verbs, all of them tiring. She is the stone on which Ada sharpens her life. The love story between Inman and Ada is gloriously awkward and real. By the time he gets home, Ada is a more full and more simple version of her old self and all of his illusions have been destroyed by the war. In a way they grew up together, apart. The social barriers that stood between them before the war are gone. Life in the Appalachians is beautiful but hard. Ada has to abandon her Low Country belle values. With Ruby’s help she becomes a practical, strong and courageous woman. It is the only thing that makes Inman’s loss bearable. And the presence of Ruby and her Georgia Boy frees Ada to stand alone for the rest of her life instead of driving her towards dependence on some other man hastily married to legitimize her child and save her financially. The friendship between Ruby and Ada is a safe, soft place, the kind of relationship between two women that should stand as an example to us all. It’s a soul sisterhood, and if we don’t have something like it, we need to look within ourselves to find the reason. How could I choose Anne over Elinor or Elizabeth? Truthfully, Elinor is too careful and Elizabeth’s snarky relationship with Darcy is tiring. I feel a kinship to Anne, from Persuasion, maybe because we both came to love later in our lives. Or maybe because in Anne’s story, she is the one who needs the second chance. Anne rejected a good man in her youth because of her family’s disapproval, even though she loved him. Nine years later, she is still unmarried when Captain Wentworth returns, triumphantly wealthy, to find a wife. Anne recognizes immediately upon seeing him again that she has always loved him. But instead of throwing herself at his mercy, Anne is a portrait of calm humility. She doesn’t chase him. She waits for him to battle his pride, and in the end, she is the winner. She’s very different from Scarlett and Ada, but for me, she is the perfect culmination of Austen’s famous nouns: sense and sensibility, pride and prejudice. She didn’t start that way, but she grew in age and wisdom and learned to trust herself and her decisions. And she does it all with kindness and poise. There is not as much meat to Austen’s heroines as there is to Scarlett or Ada, but they are good examples for us nonetheless. Our rights as women don’t always have to be defended with angry recriminations. At some point all the anger becomes noise. We can be the women we want to be with manners and beauty and faith and reserve our judgment for the moments when we really need it, which makes it that much more powerful. Loved your choices and your beautifully stated reasons. Love your words and your recommendations. I will definitely put them on my reading list!